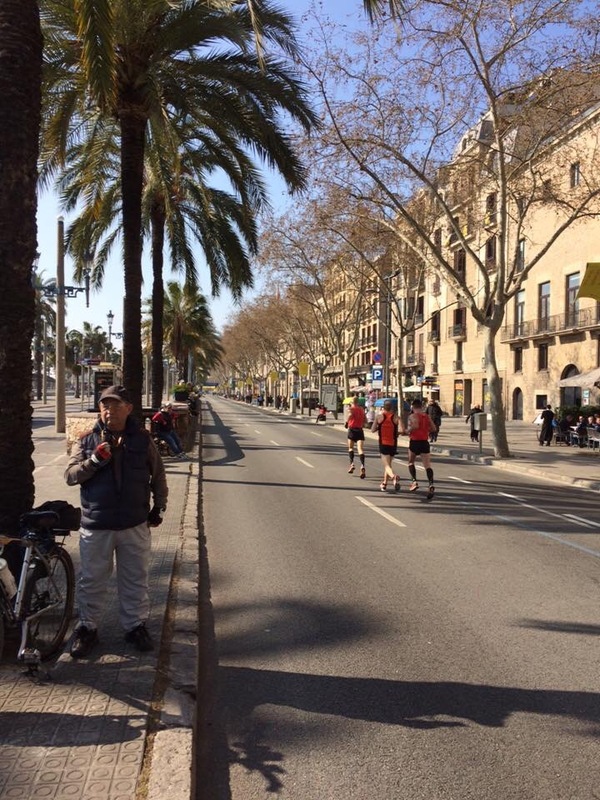 Home › Holiday running › Barcelona marathon, watching not running ! So what to do if I’m not running ? Watch running! It must have been my destiny to rock up in Barcelona the day before the marathon. 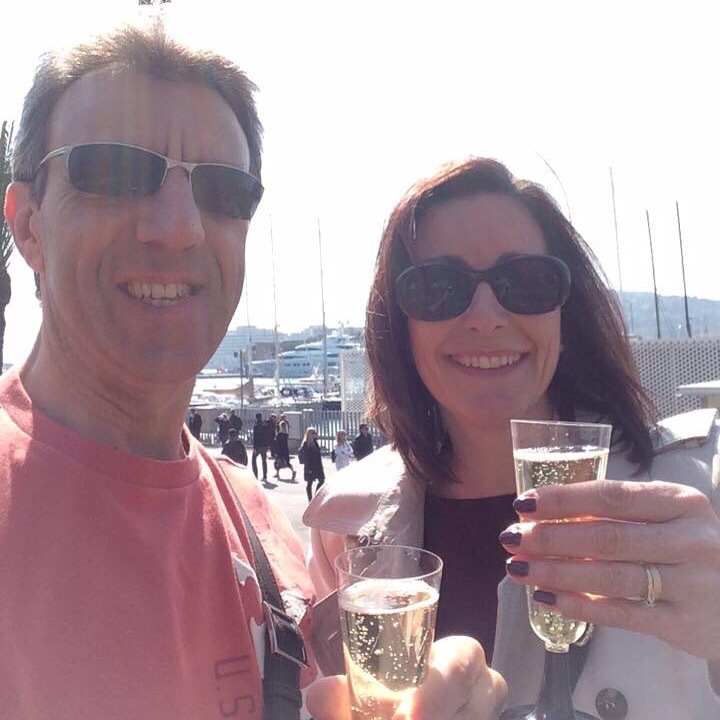 A special treat for the hubster who turned the monumentally ancient big 50, I booked a him a swanky long weekend in this Spanish city that’s been on our ‘to do’ list for a few years. Even more decadent, we left the teenmonsters at home…..well at a friends actually. Driven by our need to travel hand luggage only, the sheer size of my size 8 running shoes and for once, not making a foreign trip involve running, I left my gear at home, the itinerary all about the birthday boy for a change. Perfect weather for a mara, an 8.30 am start with temperatures around 12 – 15 but sunny. It’s a small one by the standards of the Abbott major marathons, just 17,000 runners (v London 37,000) but that means the city isn’t taken over and moving around is easy. There was no sign of a big event the night before except a note in the hotel lift that the road would be closed outside in the morning due to the marathon. By the morning the cones and barriers were out. What a lovely time of year to run, we walked to the port area (Port Vell) a flat promenade awash with cyclists, runners ( recreational) and in line skaters. It’s a perfect running spot by the sea …..I was not wishing I had my running shoes at this point… Honest ! You can run all the way along the port, passing the marina with an eye watering array of ‘mega-yatchs’ ……trust me winning the lottery wouldn’t even buy you the steering wheels of these oligarchs play things, keep running along to reach the old Barceloneta area, along the beach and turning round at the Olympic port and the Frank Gehry bronze fish. Obviously I didn’t / couldn’t . I suspect in August that would all be too hot unless you’re really up with the larks. But in March, it would have been pleasant to run any time of the day. The seafront part of the mara course is near the end, around the 39km point as runners reach the promenade and then turn up the famous ‘la Ramblas’ to the finish. Around 10.30am we heard the drums start up to fire up the first runners coming through. The hubster didn’t mind as we joined the crowds on the street for a little supporting. The guys ( and eventually one gal) coming though were all on for 2.30 finishes. And they just looked daisy fresh ! It’s so awesome and unreal to imagine how much they all train. A few had bike support team riding along side ( is that allowed in other maras??) runners had their names on their numbers and with so few passing through they were easy to read. I saw Matt with a UK run vest on easily. What a time, I gave him shout and he had breath to shout ‘thanks’ back…..awesome. We wandered off for more sightseeing. 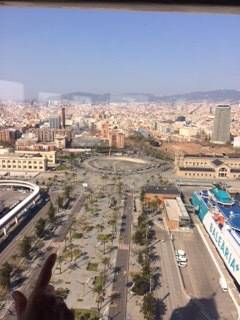 As the guidebooks recommend we took the cable car for a scenic view of the city from the seafront up to Montjuic. Such an awesome view of the sunny city and by now more throngs of brightly coloured runners adorned the seafront. The guidebook described it as a ‘daring ride’. Clearly the Spanish are a little less adventurous than we Brits and never experienced a thrill ride at a theme park. We arrived at the top for stunning city views from the garden cafe. The guidebook rightly assured me I wouldn’t be ‘fleeced’ if we treated ourselves to two coffees in the sun, in a prime spot looking down at the now ‘swarm’ of runners turning reaching iconic Place de Colom where Christopher Columbus stands on his column pointing out to sea (presumably towards America) ……misleading for the runners, ‘don’t follow his directions!’ What a relaxing way to share in the painful last kilometres of others. View from the cable car, the runners are down there honest !! A stroll in the garden, the cable car ride back down. A walk through Barceloneta and lunch purchased from a Sunday ‘farmers market’ including two fabulous glasses of locally produced cava and it was back to the course to cheer on some of the less elite runners. The cut off is 6 hours for Barcelona, so these guys were heading for 5.30 – 6.00 hour finish times. It just highlights the amazing achievement of all marathon finishers. We were in the hotel having breakfast when these guys started, strolled, had coffee, strolled, eaten a leisurely lunch strolled back to the course and these guys were still going! We did see a few post run hobblers and I have to say wearing a sadly disappointing medal. A dark gunmetal square thing that I couldn’t even see any detail on. Still it’s worth its weight in gold to those who earned it. Blogging ‘in the air’ though, I’m conscious of my own feet killing me. According to Mr. iPhone health app that measures your distance, we walked 12 miles on each of the three days we were there……so that’s going some and maybe mitigates a small part of the cava, pastries and tapas consumed in abundance! I’m now excited to get back, I missed the teenmonsters, I missed my running shoes.